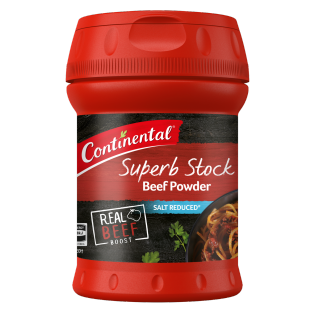 Continental's beef stock powder enhances any meals with deep, rich flavours. Learn how to give your meals an authentic rich beef flavour boost here. Maltodextrin, salt, sugar, corn starch, yeast extract, beef (4%) [fat, powder, natural flavour], colour [caramel (contains sulphites)], onion powder, mineral salt (508), free flow agent (341), pepper. Contains naturally occurring glutamates. I do not drink coffee, tea taste has changed so I do not enjoy a cuppa tea now. So now I drink Continental Beef Stock [powered]in a tea cup with boiling water on it. You should try it, it tastes so nice. I enjoy it at least 4 times a day.